College football hopefuls using SGV Hall of Fame Game as one final showcase …. FRIDAY, JAN. 30 AT WEST COVINA HS, 7:30 p.m. When it became apparent that Bishop Amat High School football standouts Brandon Arconado and Christian Wiley weren’t receiving the type of recruiting attention their teammates and fans felt they deserved, the next logical step was to take to social media to open recruiters’ eyes. For weeks after the season ended, Arconado and Wiley’s fans and teammates plastered social media with season highlight videos of the two players along with creative hashtags like #OfferArco or #OfferWiley. No one can say for sure just what sort of imprint such attempts made, but thus far neither player has been offered a scholarship to play at the next level. Both are hoping one last good performance when they strap it up for the West team in Friday’s SGV Hall of Fame All-Star Game will change that. Kickoff is 7:30 p.m. at West Covina High. Arconado and Wiley aren’t alone. For every Octavius Spencer, the Monrovia receiver with a scholarship to UCLA, playing in Friday’s game, there’s 10 others who are on the outside looking in when it comes to playing in college. That’s why game organizers felt it was important to move a game that was once a late spring/early summer fixture to the middle of winter, right before national signing day on Feb. 4. Arconado was a special teams freak, averaging 41.1 yards on kickoff returns. He had over 1,000 yards receiving and 12 touchdowns and was also an all-Mission League selection. Wiley was the Mission League’s Defensive MVP this past season and was the Tribune’s Defensive MVP as well. He finished with over 100 tackles against some of the best competition around. In addition to being one final recruiting showcase, Friday’s game also offers fans one last chance to see some of the top senior talent around. Then there’s also that whole thing about which side of town plays the best football. Things have a changed a bit this year, though, with a geography change in term of where both teams draw their talent from. Instead of using the 605 Freeway as the divider, game organizers pushed things out to Azusa Avenue. Both teams can also go further out than before. The East is coached by Colony’s Steve Randall, who guided the Titans to the Central Division championship. The West is coached by Maranatha’s Steve Bogan and Crescenta Valley’s Paul Schilling, who coached the Falcons to a 14-0 record and Southeast Division championship. The East leads the 23-10-2 and has won the last seven meetings. 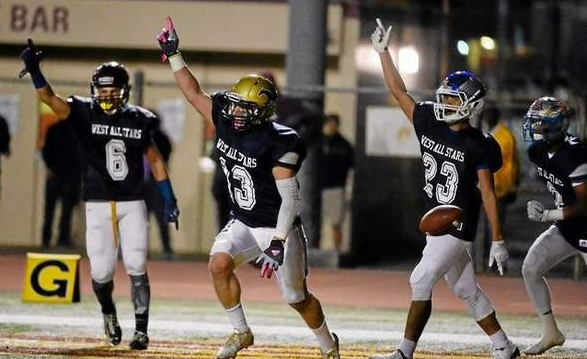 The size advantage typically enjoyed by the East team in the annual SGV Hall of Fame All-Star Game for high school football seniors is alive and well. Only this year it extends beyond the offensive and defensive lines. Sure, the West is better equipped this year to handle the East’s physicality at the line of scrimmage, but what about on the outside where matching up to specimens like Etiwanda tight end Michael Neal could be a major problem? Kickoff for the 36th renewal of the local rivalry between East and West is 7:30 p.m. on Friday night at West Covina High. Neal is 6-foot-5, 220 pounds. Then there’s Damien receiver Mackenzie Sternquist, who is 6-3, 220. Throw in Rancho Cucamonga’s Blake Fisher at 6-4, 185 and it’s easy to see that the East has an embarrassment or riches on the outside. Getting them the ball will be La Mirada quarterback Christian Lara and Chino Hills’ Zac Sturdivant. Coaches are hopeful that Wednesday and Thursday’s practices will give them a better idea of what they have in the passing game since last weekend’s practices were marred by a windstorm that hit Southern California. When asked to single what unit had impressed him the most, Randall was quick to say his offensive line. The East is blessed with its usual helping of good size, but Randall likes other things about the group, too. “What’s really impressed me is the continuity of the whole offensive line,” Randall said “Guys are playing well next to each other and they’ve been there for every practice. Some of them are traveling from the Whittier area, La Mirada and La Habra and they’ve been here and worked hard. Led by South Hills guard Josh Radecki (6-4, 315) and La Mirada tackle Angelo Lojero (6-2, 285) the typical big East size is there and could get boosted with the expected return of Glendora’s Ben Northup (6-5, 300), who missed practice last week while on a recruiting trip to Hawaii. The East has built a seven-game win streak in the series and Randall gets the sense his team doesn’t want to be the one to let it end. The will to win in an all-star game is always a question mark, but that doesn’t seem to be a problem for the East. Colony is stepping up its nonleague schedule next fall and will put itself to a serious test in Week 2 when it visits Pac-5 semifinalist Bishop Amat. 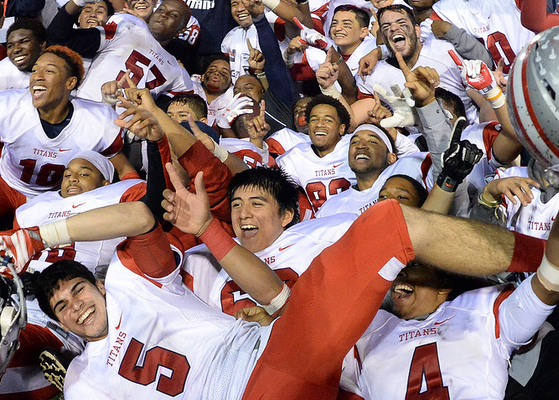 The Titans went 12-2 in 2014 and won the Central Division with wins over Charter Oak, Pomona and Glendora along the way. Colony has some solid pieces back like QB Josh Thompson and corner Khalil Dorsey (11 INTS in ’14). Bishop Amat, as we all know, is loaded.